Reappearance Factors are the factors that pave the way for Imam’s Reappearance and are considered as the reasons of his reappearance. It must be said about it: Although the main factor of Imam Mahdi’s reappearance is the “will of God”, but what humans can do for reappearance preparation is the elimination of factors which causes his occultation and to make themselves prepared. This preparation is achieved by doing their duties and obligations specially the duties of the absence era such as: Waiting for the reappearance, praying, patience, self-development, intellectual and social growth. This preparation should be proportionate to the acceptance of global governance: which means it has to be widespread and public and the public opinion should be ready to approve and support him. 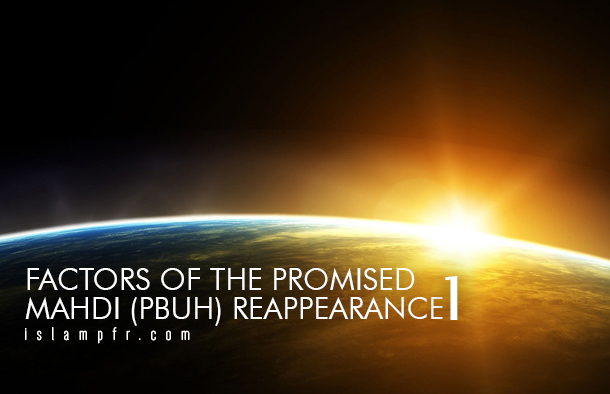 Whatever that plays a role in the reappearance of Imam Mahdi (PBUH) and is considered as a reason of his return, can be counted as a Reappearance factor. We can say: Although the main factor of Imam Mahdi’s reappearance is the “will of God”, but what humans can do as reappearance preparation is to make themselves ready: Because every revolution or movement that occurs for a certain purpose, can be successful if the background of the movement is prepared in every field ,otherwise the revolution will fail. So people’s preparation is one of the causes and factors of Reappearance; hence general public should call for him and public opinion must be prepared to approve and support him. In other words, the optional and changeable factors of his occultation must be removed. It is clear that people have no authority over these factors to change them. But some of other occultation factors are changeable. As it has been noted in some of the holy letters [of Imam Mahdi (PBUH)], disloyalty of people and their sins are the predisposing factors of his occultation. “If God blesses our Shiites to gather their hearts on the fulfilling of the Promise, their good fortune of meeting us would not have been delayed, and the prosperity of seeing us with right and proper knowledge would have been hastened. Nothing has kept us from them except their unpleasant and undesirable deeds which is coming to us from them” . The expression “علیکم بالصبر” “you should have patience” explicitly states that Shiites duty in occultation era is patience on separation. It is clear that patience means being resistant and firm in belief, practice and performance of his way and doctrine. The real awaiting person has such knowledge in scientific aspect that the absence is just like the presence for him; which means he/she doesn’t have any doubt in recognition of Imam of his/her era and in practical aspect he/she preaches people and invites them in overt and covert. When the passive awaiting person sits around and does nothing and on the pretext of not being able to do something, doesn’t do anything to make the reappearance happens, the positive awaiting person increases his/her knowledge and good deeds every moment, make him/herself prepared for the reappearance and tries to make himself/herself a good awaiting person. To sum things up, we should say, belief in the unseen, the tendency to justice, hatred of injustice and oppression, confessing the truth and invitation to good are lied in the positive waiting. In some of the narrations, Praying is considered as the major duty of the occultation era. As Ishagh Ibn Yaghub related from a letter which was received by Muhammad ibn Uthman that Pray a lot to hasten the reappearance. …. This means that while people have hope in non-divine powers, there won’t be any thirst for Imam Mahdi’s justice and they won’t seek and demand for Imam Mahdi in an appropriate and necessary way. Prerequisite preparations of Imam Mahdi reappearance (PBUH), Muhammad Fakir, Meibodi. Safi Golpayegani, Lotf ol allah,Montakhab al Asar. the prosperity of meeting us would be hastened. Have prophets had common goals?